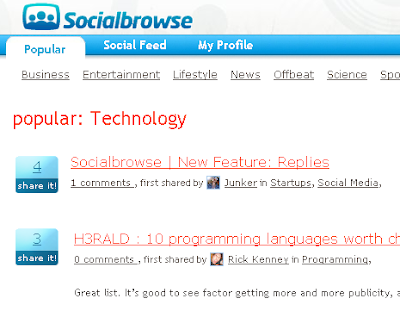 I rather like the SocialBrowse plugin for FireFox. The plugin allows you to share pages and summaries with friends on your network or simply to comment on news or other people's discoveries. It is a social system and if you discover the 'good stuff' then you'll get awarded with points that help your profile stand out and therefore attract more followers. Followers see your recommendations pop up in the bottom right corner of their screen while they're browsing. In many ways it reminds me of Twitterfox or Twhirl. ... there is a way to logout, it's just not convenient. If you go to your Firefox profile, there is a file called SBCredentials. Just delete that and then restart Firefox and Socialbrowse will ask you to log in again. In Windows go to: C:\Documents and Settings\\Application Data\Mozilla\Firefox\Profiles\.default where is your computer's account and is some random string in front of default. Did it work? I ended up uninstalling and nuking anything that had any suggestion of SocialBrowse details in my profile. That worked. I've put the plugin back in place though and you can find my profile here.